New blog posts on the Faculty of Natural Sciences and Technology blog will now be published on NTNU TechZone. NTNU TechZone is a blog about technology, natural sciences, research and teaching at NTNU. The blog is a collaboration between the Faculty of Natural Sciences and Technology (NT), the Faculty of Engineering Science and Technology (IVT) and the Faculty of Information Technology, Mathematics and Electrical Engineering (IME) at NTNU. The NT blog will be available with all blog posts for sometime. Camilla Sommerseth, former PhD candidate at the Department of Materials Sciences and Engineering, now a scientist at SINTEF, won the Best Carbon Paper Award at the ICSOBA conference. ISCOBA – The International Committee for Study of Bauxite, Alumina & Aluminium – organized the conference in Quebec, Canada in October 2016. 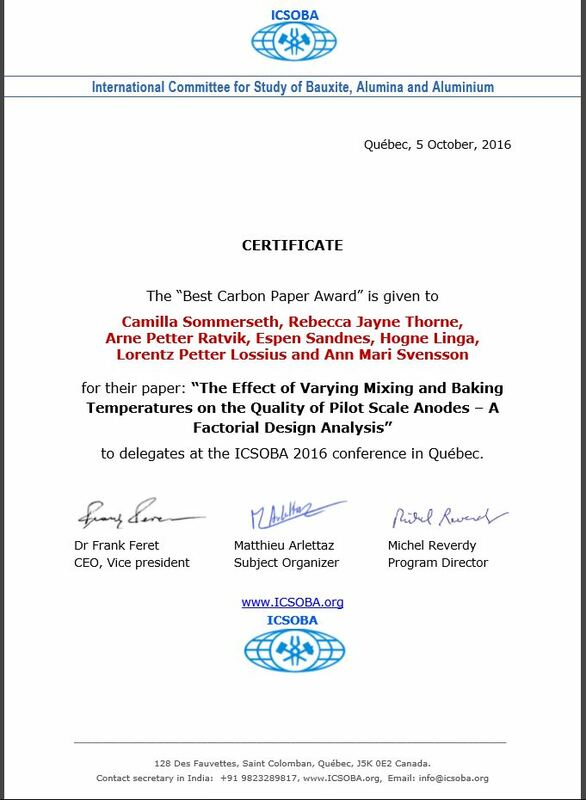 Sommerseth and her coauthors received the award for the article “The Effect of Varying Mixing and Baking Temperatures on the Quality of Pilot Scale Anodes – A Factorial Design Analysis” by Camilla Sommerseth, Rebecca Jayne Thorne, Arne Petter Ratvik, Espen Sandnes, Hogne Linga, Lorentz Petter Lossius and Ann Mari Svensson. The article is based on Sommerseth’s work as a PhD candidate. She defended her thesis in April 2016 – “The Effect of Production Parameters on the Performance of Carbon Anodes for Aluminium Production”. Ann Mari Svensson was her supervisor. Egil Skybakmoen (SINTEF), Arne Petter Ratvik (SINTEF) and Lorentz Petter Lossius (Hydro) were co-supervisors. Group photo from the conference.